While researching a trip to Catalina Island I found very few photographs of the interior of the island. Well, I decided to do something about the lack of photos. Below are links to four pages with photos of the interior Catalina Island. Additional description of the areas can be found on the pages. Start at the highly scenic Little Harbor, proceed along the coast, then turn inland and proceed through Middle Canyon to Airport Road. Start at Avalon and proceed up the mountain on a eucalyptus-lined road to Middle Ranch Road, about halfway to the airport. Start at Two Harbors and proceed to Little Harbor. Most of these photos were taken from the bus and are lower quality. 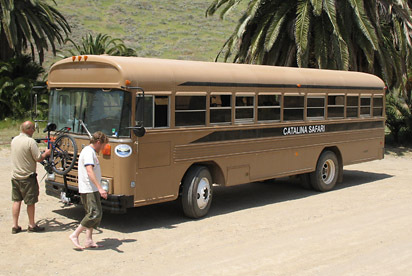 I wanted to know more about the Safari Bus, but the only info I could find was on the official web site.